Looking for a special accessory that just screams your personality to the world? Bored with the plastic, unoriginal pieces at your local mall? If you answered yes to one or both of these questions, you may be an indie shopper at heart! "Indie shopping" is a phrase used to describe buying original pieces of jewelry, clothing, accessories, and other goods directly from their artists/creators instead of from a mass retailer. Buying directly from artists can be a bit pricey, depending on what you're buying, but it's always worth it. Instead of paying a low price for a cheap-looking piece of plastic that a million other people bought that same day, you could pay the extra few dollars and get a high-quality, sometimes even one-of-a-kind accessory, and feel good about yourself for supporting someone who's doing what they love! 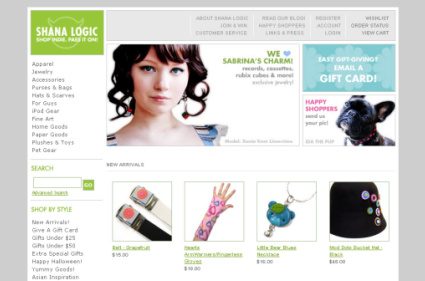 One online shop at the forefront of the indie revolution is shanalogic.com (previously known as pixelgirl shop). The site sells a variety of goods, ranging from jewelry and buttons to hats, t-shirts, notebooks, and even fine art! The first thing you'll notice when you visit their site is its sleek simple look and easy navigation. New and popular items are listed on the front page with pictures and prices, and all the shopping categories are listed on the left, waiting to be browsed. At the top are links to learn more about the site, customer service, the shop's blog, their happy shoppers section, and much more. You can even set up a wish list to send to family and friends when holidays and birthdays roll around! 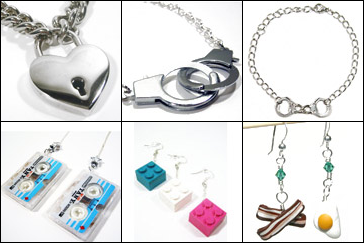 Some of the most popular items on the site are the Heart Padlock Choker (by Marty Flint, $32), which I recently bought for myself, the Sassy Handcuff Choker/Necklace and Bracelet (by Sabrina's Charm, $15 for the necklace, $10 for the bracelet), and a plethora of adorable original earrings. These include Mini Cassettes (by Sabrina's Charm, $14), Legos (by Sabrina's Charm, $10) and even Breakfast Foods (by Amy Secrest, mix and match, $18). If you're looking for a gift for your guy, don't fret! There's a plethora of manly shirts, jewelry, and accessories for the special dude in your life. The site is very professionally run, but doesn't lack that personal touch. When I got my Heart Padlock Choker in the mail, it came in a white jewelry store box with a shanalogic.com sticker on it, a shanalogic.com button, and a printout of my order with a little thank you written on it! These small additions add tremendously to the order and made me feel happy and warm inside. I felt valued as an individual customer, not just someone willing to spend money. It's like a high-tech version of your local Mom-and-Pop store! Whether you're an all-original fashionista, trying to find that perfect gift, or simply sick of the lack of creativity plaguing your local mall, then shanalogic.com is definitely the place for you! Some of the items may be a little pricey, but this is certainly a case of "you get what you pay for". 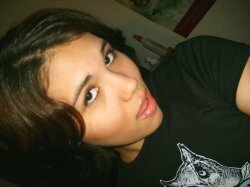 You get the highest quality handmade items, and you help support artists who are making a living doing what they love! If all this doesn't convince you, and the prices are still a little high for your taste, have no fear. Sweet Designs readers can simply use the code IndieLOVE for 10% off at checkout!